Anyone worth their salt as a consultant will tell you that you need a plan to get the most out of social media. This is absolutely crucial to your success. What’s missing from most social media plans, though, is a system. A set of rules, if you will that governs how effective a plan can be. It’s a way to implement the goals that you have and an order to do them in. I’ve seen and built a lot of social media plans. Some were successful, and some were not. The ones that were successful had one thing in common: they setup their plan with a systemized approach. In other words, everything in the plan is built to fulfill a specific purpose. Nothing in the plan deviates from that purpose. There is a better word than purpose, though. Some people like to call them “goals”. I like to call them “phases”, because you can have multiple goals within a phase and still be working towards that one purpose. Want to know what the most successful social media plans had going for them? They tackled these phases one a time and in order. When I first started in social media, the company I was working for didn’t have a social media presence. Since this was my first social media job, I had to learn how to set them up and make them work. I had read a lot of stuff about how social media was so powerful. About how it could increase your sales and popularity far beyond what you could achieve normally. So, I had hope that it would work. When we first started with Facebook, it was still pretty early for businesses to be jumping on. It was easier to build an audience then. But that’s not what I was focused on. Instead, I was doing all kinds of things. And I didn’t understand why I wasn’t getting the engagement that I had heard about. Or why I wasn’t getting people to bring in the coupons we would post, or respond to our online sales. 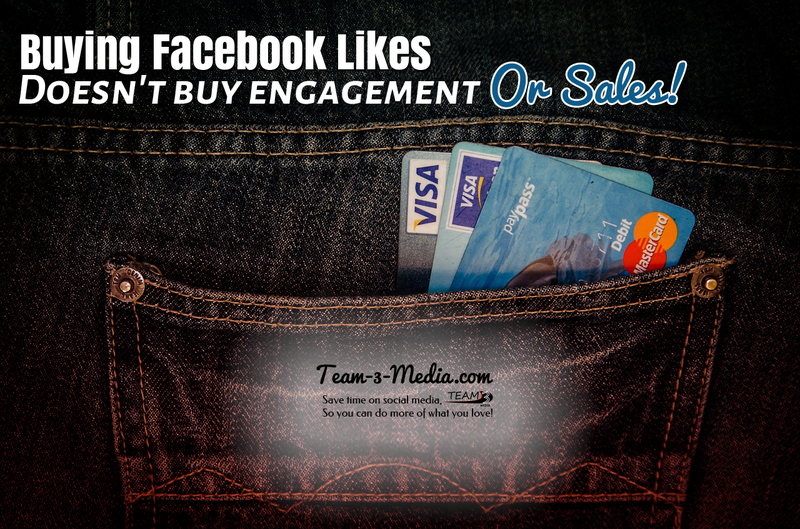 It wasn’t until we ran a big “Like Us” contest that I really started to see engagement and conversions on our Page. In fact, our audience grew so much from that contest, that the engagement and conversions had also skyrocketed. It was then, that I understood how social media works. See, the simple truth is, you have to have an audience that will support the engagement and conversions. If you don’t, it won’t happen. No amount of pie in the sky thinking will deliver that for you. No matter what platform you’re on, you have to build an audience first. Unfortunately, building an audience is actually one of the hardest parts of the whole process because it’s a step that consists of three separate objectives. The first objective is to get people to show up. The second is to get them to pay attention. The third is to get them to want to come back and read more. We’ll tackle how to get all of these to work together in a later post. For now, let’s just look at the basic activities you need to do to get started. Use the basic tools of the platform (e.g. Twitter = hashtags, Facebook = shares and likes). Run a Contest or Promotion to generate excitement. The next phase to tackle once you’ve built your audience is to get them engaged. If they’re already engaged, then that just means you have an advantage. But if they’re not, you may have a hard road ahead of you. My first success had really taught me that you could be achieve your goals with social media if you focused on the right phase at the right time. But, later, I struggled with building engagement on other platforms and social media accounts. A couple of years after I started doing social media, I started to take on other clients on a freelance basis. I thought I knew what I was doing by that point. After a few months, though, it became clear that I really didn’t. I used what I knew worked: I focused on building an audience before building engagement. But I wasn’t getting the same results. I didn’t understand why it seemed to only work once. I thought, that must have been a fluke. But I questioned that assumption, because I had read so many articles telling me different. So, I decided to dig deeper and figure out why it had worked so well the first time. I did this by trying a ton of different things to build engagement (including running more contests). My conclusion was this: in those early days we had grown our audience so fast by harnessing the excitement that a contest produces. This meant that our audience was already engaged. It gave us a leg up when it was time to move to this next phase. Because we were also posting consistently to Facebook, and we understood what was working on the platform, we were able to keep that engagement going. Once I understood that, I knew that the key to getting more engagement was to give it a kick-start. Contests work well for this purpose, but they’re not the only answer. Sometimes, they’re not even the right answer for the client. There are lots of activities that build engagement. Most of these same activities you’ll notice are also ones that are used to build an audience. That’s because the same characteristics of social media that build connections, also help spread those connections farther than they would normally go. Below are a list of activities that you can use to build engagement. Run a Contest or Promotion to generate excitement. In fact, run these multiple times throughout the year to get the most benefit out of them. Bring them into your sales funnel. Conversions matter in social media. It’s the return part of “Return on Investment” that we’ve been hoping for. That doesn’t mean that we don’t enjoy the warm fuzzy feeling and the connections we make with our community. Those are important, too, and can keep us going when the conversions aren’t happening like they should. But most of us want to get something more out of it. Most of us want to be able to justify the time we’re spending talking with people, researching content, posting, spending money on ads, and the hundreds of other things you need to do to keep up with your social media accounts. Conversions are tough to achieve, especially on social media. That’s mostly to do with a glaring difference between a business’ motivation and a person’s motivation on social media. People get on social media to connect, or to find out what’s going on, or even just to unwind. Businesses on the other hand want to connect with their customers, but they also want to make the sale. Those motivations just don’t line up. Often times, this means that social media posts by businesses can be seen as an intrusion. Or at the very least, they can seem out of place. So if conversions are our goal, then how do we go about getting them? Some of the same things you do to build an audience and build engagement also work for making conversions on social media. Again, this is because of the way social media works. The main thing that companies who make conversions on social media do, though, is they connect with their followers. They learn what their audience likes to hear, and what they like to talk about. Then they take that information and they apply it to how they sell their product. That’s why these same activities can work for conversions, just as well as building an audience and engagement. Run ads or use other promotional tools. As you can see, the main difference in most of these phases isn’t the activities, it’s the intention and execution. It’s the focus of the conversation. I have been successful and have seen others be successful in social media from following other systems. But I’ve achieved the most success when I followed this system step-by-step. Your turn. Have you found a system that works for you? Are you having trouble building an audience, your engagement, or your conversions? Have you seen success when you focused on one goal at a time? Let me know in the comments below. One of the easiest ways to get more Facebook Likes for your Facebook Page, is to add the Facebook Like button (targeted at your Facebook Page) to your website. This is a simple and often overlooked tactic which could result in more Likes for your Page. Why does it work? In the first one, a visitor to your website sees the Facebook icon and is enticed to click it. Once they click it, though, they have to actually go to your Facebook Page in order to “Like” it. In the second one, a visitor to your website sees the Like button and is, also, enticed to click it. Once they do, that Like is immediately translated to your Facebook Page. It’s so much easier for a person if they only have to click once. Anytime you can make a conversion easier on the consumer, the more likely they are to do it. How Do You Get the “Magic” Facebook Like Button? First of all, how does it work like magic? The Facebook Like button works auto-magically with one click as long as that person is logged into Facebook. These days, who isn’t? Honestly, I can’t remember the last time I logged out of Facebook. And I would bet my right arm that you can’t either. As you can see from the screenshot below, there are some options that you can choose to enhance the Like button. But they need to be weighed against how much space the button takes up. For example the first set of options makes the button (and all its attributes) really big. The space you want to put it in may not be big enough to hold everything, and it will cut part of it off. All of the attributes are optional, except for your Facebook Page URL. A Quick Note: The “Width” option will not increase the size of the Facebook Like button (which is quite small). Instead the width controls the overall width of the Like button element. For instance, in the example above, the Like button element area covers the Facebook Like Button, the Facebook Share button, and the words describing the number of likes. So, increasing the width would only increase the space around the entire button set. The screenshot below shows my Facebook Page address (or URL) in the text box below “URL to Like”. To find your Facebook Page URL, go to your Facebook Page and copy and paste what’s in the address bar into the top-left box (as shown below). That’s step one. The next step is to decide what you want the overall button to look like. I’ve already talked about how the default set of options gives users a lot more information, but makes the button much bigger in size. I’ll explain that extra information, and go through the rest of the options, with screenshots below. The first set shows the like button in the “Standard Layout” which adds the additional information of the person’s friends (the name here has been covered up for privacy reasons) who Like the Page. This is great for showing “social proof”, which can help your Page seem more Likeable, especially if you have a lot of Likes already. If you have a smaller number of likes though, I’d suggest going with one of the other options. You can also see below that there is an extra button (the share button) and that there are faces shown in the screenshot below. Most of these have been covered up to protect the privacy of people, but I left my own mugshot there, so you can see an example of what they will look like. If you uncheck the “Show Friends’ Faces” option, it makes the button are look cleaner. This option works well for those who don’t want the added space the “faces” take up and for those who don’t necessarily care about social proof. You can, of course, disable the share button. Since you’re trying to get people to Like your Facebook Page, adding a Share button only confuses the issue. The next layout type is the “box_count”. This displays the Like button with a Like count over it, and everything is stacked on top of each other in a, you guessed it, “box” configuration. This layout, and in fact, the rest of the layouts do not show faces. So, if social proof is important to you, go with the standard layout or the Like Box (which I’ll cover later). This option works for those site designs where a more square or vertical section is available to place the button in. It’s also good for those who want to still show off the number of likes they have. Since the box count does not come with the option to show faces (even if you check it), the only other option here is to take away the Share button. This makes the button into a nice compact design that could fit almost anywhere. The next layout type is the Button Count. This layout is much like the box count layout, except that the number of likes is on the side instead of on top. This makes this button much more suited to a horizontal space. Of course, once you take the Share button away it will fit into an even smaller space. Again, this type of layout with the number of Likes showing appeals to those who want to use social proof to encourage more Likes. The last layout type is the simplest. That’s probably why it’s called the Simple Button layout. It is not only the smallest, but it’s also a great option for those Pages which have a smaller number of Likes, and don’t want to advertise that fact. This button, too, can be combined with the Share button, if you like. The version without the Share button is tiny, minuscule even. This means you don’t have to worry about where the button will fit. A quick warning: this next section involves some html no-how. If you don’t know what you’re doing, forward this article on to your web developer or admin and have that person complete these steps. The first three options require a little bit more work to install them and give you some more options for how much information you get when someone presses the Facebook Like button from your website. However, they are not necessary, in most cases. The easiest code type to use, and the one that will not bog down your site is the “URL” type. Which is just as it sounds, it installs a URL, which points directly to your Facebook Page, but has the added benefit of allowing someone to Like your Page with one click! Woot! Your next step here is to copy and paste the code into the html of your website where you want the button to appear. Again, if you don’t know what you’re doing get someone knowledgeable to handle it for you. There are some alternatives to just grabbing the code off Facebook. If your website is on WordPress, then there’s several options in the form of “plugins” you can install with no programming knowledge. I won’t detail all the options here. Just make sure to check out the number of stars each of these plugins has, check out some of the reviews, and make sure it’s compatible with your version of wordpress before you install. There are also plugins for drupal, joomla, wixia, and other website builders or (content management systems). Just use Google to search for them. Whether you choose to grab the code from Facebook, or use a plugin, installing the Facebook Like button is just one way that you can increase your Facebook Page Likes. Remember, though, that Facebook Likes are only the first step in the journey. It’s great to say that you have 1,000, 10,000, or whatever number of Likes, but it’s not your end game. Those Likes represent real people who (hopefully) want to buy from you. Even if they don’t want to buy from you, they have indicated that they’re interested in your business in some way. Now it’s your turn to give something back to them. Give them a reason to read your posts, and keep them coming back for more. This is the way that you start cultivating relationships online that lead to sales. 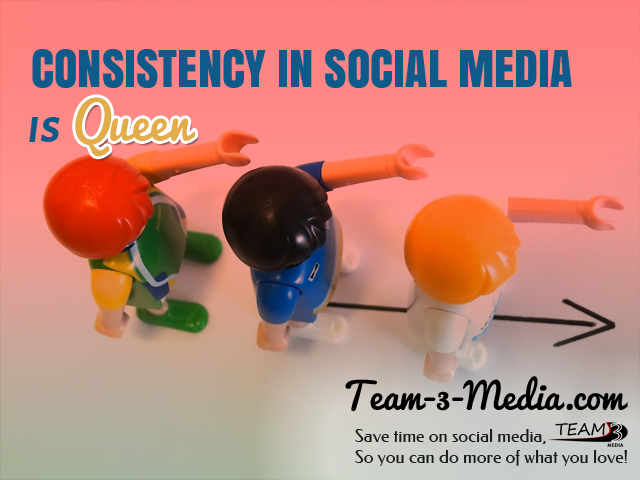 This week’s social media tip… be consistent. If content is king, consistency is queen. Consistently posting to your social media accounts is incredibly important for several reasons. It trains your audience that you always have something to say, so they come back for more. It helps keep your engagement steady during those times that you’re not heavily promoting something. It gets you in the habit of publishing content, which may be the best reason of all. But what does consistency look like? It’s not just about posting a certain number of times a day. Though this is important. Consistent content is also about what you post. Remember that your brand voice is important. If you’re going to post something make sure it aligns with what people expect you to say. Your voice matters. I can’t say that enough. Your audience doesn’t just recognize you from your profile photo online, they recognize you from your voice. If you suddenly switch up your voice, your followers may not recognize that it’s you. In extreme cases, they may even take offense to something you say or get confused. Remember the goal of social media is to get followers and keep them engaged. Voice is particularly important to this goal. Without it, people won’t have something to identify with. That connection with your followers is one of the real powers of social media. It’s part of what gets businesses the results they do on this marketing medium. 2. Post roughly the same number of times per day. There’s a rule that most of us in the industry follow. That’s to pick the number of times you’re going to post each day and stick with it. Again the reason this is important is largely based on what your followers have come to expect from you. If you start posting more often or less often, you might see unfavorable results. The one place you can see this rule in action is on Facebook. It is here that you might see people unlike you or (even worse) hide your posts if you suddenly start spamming them. It is also here that you will start to see less engagement than you did before if you are posting less. The same is true for other platforms, but Facebook is the biggest offender when it comes to violating this rule. That’s not to say that you can’t experiment with the number of times you post. Experimenting can actually be very important to figuring out what gives you the most engagement. If you’re going to experiment, though, do it slowly. Increase or decrease your posting by 1 post at a time and keep at that for a while. This will give you the best data on whether something works or not. 3. Post Around the Same Time Each Day. This is another industry rule that works for a lot of different businesses. Posting at about the same time every day is another way that people can expect to read your content. It’s also important when you’re first starting out to establish a “baseline” that you can experiment against later. If you’ve been posting at the same time for the last couple of months, but feel you could get better results by changing it up, then you already have some data to compare it to. Just remember to keep any experimenting to a minimum. Remember also, the time you post depends on your audience. For some businesses, posting just after people get off work gives them the best results. For others, it could be later in the evening. 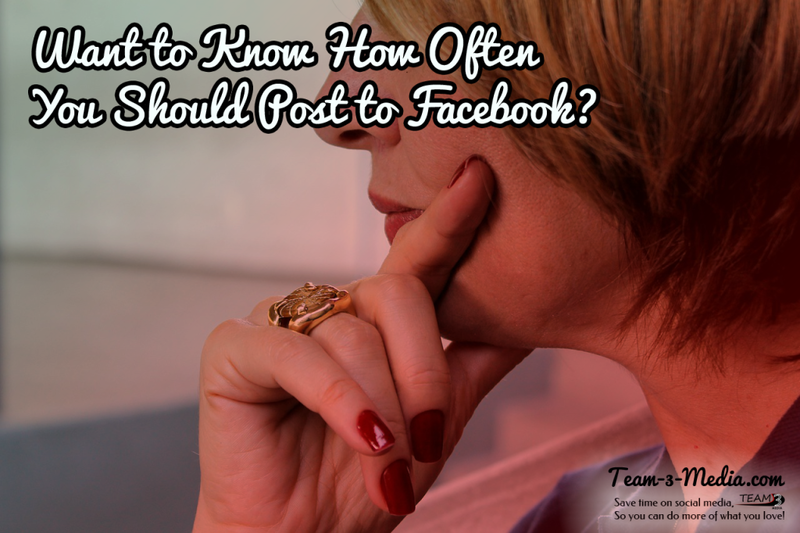 Again, posting at the same time each day will help you determine whether it’s the right time for you to be posting. I know you’ve seen the ads, or even just h eard about “buying Likes”. At first it sounds like a good idea, especially if you’re having a hard time building those fans. Why not plunk down $25, $50, maybe even $200 if it will get you a bunch more fans all of a sudden? Wouldn’t that mean that more people are willing to Like your page, because they see that a lot of other people already Like you? While this is certainly true, the cost of buying those Likes goes way beyond the initial payment you made. Let me tell you a story as an example. When I went out on my own for the first time it took me a while before I got an actual “social media management” client. I had taken other jobs, but no one wanted to pay me the money to manage their posting and engagement. This type of work requires a high-level of trust. Even though, I had four years experience doing this for multiple companies, I hadn’t been networking long enough to convince someone to take this over. Finally, though, I landed my first client. We talked over strategy and what types of posts I’d be running, as well as ideas on how the business could help to supply some of that content, since they were out doing the job every day. We agreed on a number of posts per month and the type of content that would run. I was stoked. After so long pitching and not getting anything, the actual “strategy session” was a breeze. So, off I went. Like a good little social media manager, I grabbed content from other sites and their own, mixing it together in the right combination like a wizard mixing a potion. Then I scheduled the posts and waited for the engagement to happen. I wasn’t worried about the engagement. After all, I could see how many Likes they had. From my previous experience, I knew that this was a very good number for engagement. I also knew that it might take a little time for the engagement to pick back up since they hadn’t posted in a while. I checked the Page everyday and all I heard was crickets. There were a few Likes here and there, and even a comment, but nothing like what I expected. At the end of the month, I reported the stats and mentioned in my report that it would take a little time for the engagement to pick back up. During the second month, the same thing happened. We got a bit more engagement, but, again, it was not what I expected. I also checked the reach of the posts and noticed that it was much lower than I anticipated. My second month’s report looked pretty much the same as the first. The business owner didn’t say anything. For the third month’s content I really dug into what was getting the most engagement, and when it was getting the most engagement, and tried to recreate that. Again, though, the same thing happened. I was devastated. This had never happened before. I had always been able to create content that people responded to and build on that. Those Likes that you buy are sold by companies who do two different things: they create bots that act like real humans which create Facebook accounts and then Like pages, or they are actual human beings that are paid to click Like. Oftentimes these Likes come from countries such as Indonesia. If you’re a small business owner in the Midwest who only has a brick and mortar location and no online store, are people from that country really interested in what you sell? Don’t be fooled by the ones who say that they are selling you “real Likes”. Even if a human is clicking Like on your business page, it doesn’t mean that they are interested in your product. Be smart, and get Likes that will become part of your customer base. And the last reason that buying likes is bad for your business, is that many of these likes will never engage with your Page, so you’re getting nothing out of them. How does it look if someone comes to your Page, sees you have 1,000 likes, but only a few likes, comments, and shares on your posts over the last month? Seems pretty weird, huh? Is there a Way to Legitimately Buy Likes? Yes, there is. Facebook has a specific ad type that aids you in getting more Likes for your Page. If you know what you’re doing with the targeting you can even target those people who are going to be more interested in your product or service. This is one of the best ways to “buy” Likes. Don’t, however, buy them off some guy on Fiverr or another site that is promising x number of Likes. Those sites are likely using Like Farms to get you those Likes. What About Other Ways to Get Facebook Likes? There’s a ton, actually. You can install a Like button on your website where visitors can Like your Facebook Page without ever leaving. You can invite your friends and business colleagues to Like your Page. You can, even, promote your Page on your business cards or other print marketing pieces. Here are 20 more ways you can legitimately get Facebook Likes. The bottom line: don’t be tempted to build your Facebook Page by buying Likes. You are only hurting yourself in the long run, especially if you want to get more out of it (like sales). 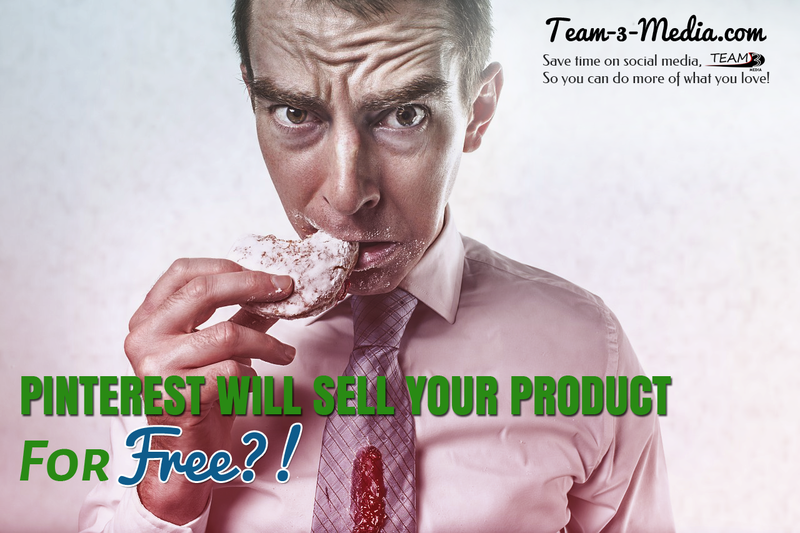 Pinterest Will Sell Your Products for Free?! So, I, as usual, was looking through my email before I went to bed. A bad habit, I know. It usually keeps me up long past when I wanted to go to bed. Especially if there’s a good newsletter or blog post in there. I usually take a look at my non-important stuff at this time, trying to decide if it’s worth my time or not. I saw an email from Pinterest and almost passed it up. I really don’t need another email on the 10 best DIY projects for this fall. But then I saw the subject line: “Your pins price has dropped!”. Hmm…not a DIY project email, after all. So, I clicked on it and lo-and-behold, I saw this. Until I got this email, I had complete forgotten about this business feature of Pinterest! To be fair, it’s not something that they toot their horn about. Although, in my opinion, they should. I think more businesses might jump on the Pinterest bandwagon if they knew that Pinterest would sell their product for them. 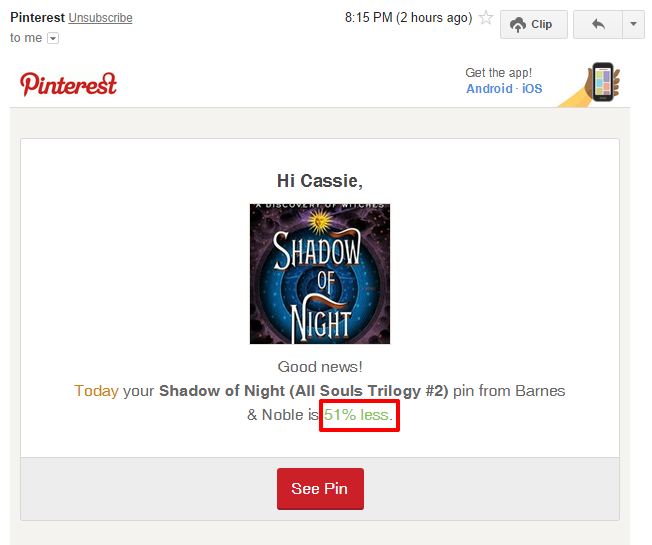 This beauty of an email was informing me that a book I had pinned was now cheaper. I already bought this book, so why is this important? Because your business could benefit from this, too! A while back, Pinterest launched a feature which you could integrate into your website called “Rich Pins“. You install a line of code onto your website that will add price, size, color, product description, or other data to product pins that come from your website. Basically, it gives the user the information needed to make the purchase decision. One less hurdle to the buying-decision means that the sell is easier to make. Check out this link to see the steps involved in adding it to your website. You’ll need someone knowledgeable to help you install the code and integrate it with whatever tags you have setup. Or get them setup, if they’re not already. Then the last step is to test and apply for your data to show up on Pinterest. It can take a couple of weeks to hear back. Once you do, though, people pinning from your site will now see the price and other data on their pins. And, more importantly, so will their friends! How Can You Use The “Price Dropped On Pin” Feature? Once you’ve got the code installed and integrated it with your extra tags, all you need to do is setup a “sale”. A lot of ecommerce platforms and plugins let you do this easily. My favorite, for WordPress, is WooCommerce. It’s free, and fairly easy to use. Once you do that, Pinterest will see the data and send out an email notification to anyone who has pinned the product with it’s original price information. It’s as simple as that! For those of you thinking about the holidays, think about what this could do for an online sales. Let me know if you need help getting the code installed on your site and applying for your rich pin data. In most cases it takes a couple of hours to add the code, test, and start the application process. Each install will be custom (since I don’t know how your website is set up ahead of time). So, every project will get a customized quote. If you’re interested, fill out the form below with your information and I’ll get back to you. Facebook has updated its newsfeed again. But this time, it’s looking at posts in your newsfeed in a different way. 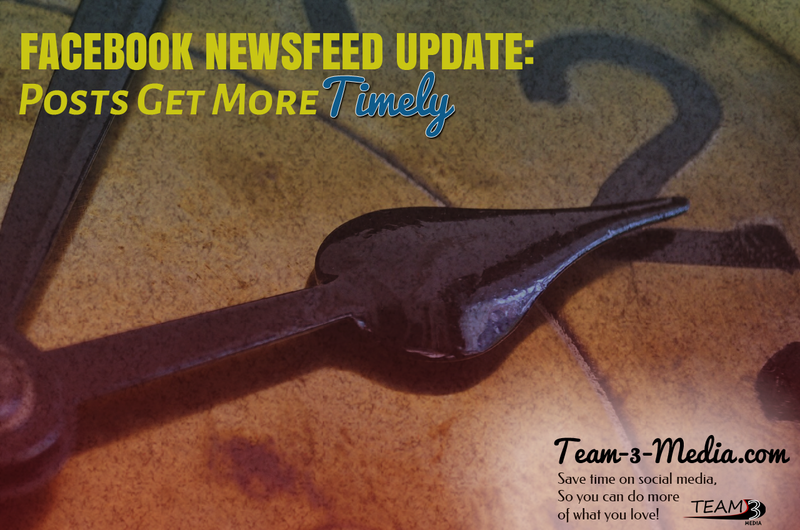 Most of Facebook’s newsfeed updates revolve around what type of content shows up there. This time, however, Facebook is focusing on the timing of that content. Here’s an example. Let’s say that one of your friends graduates. They post their obligatory parent/graduate picture. It gets a ton of likes, comments, and shares within the first couple of hours. It might continue to get more engagement throughout the day and into the next. Sometimes, the engagement goes a little further, but not much. This particular post was very popular in and shortly after that moment, but not really later on. In other words, the timeliness of user’s behavior is starting to factor into how often and when Facebook shows posts in your newsfeed. This “trending topics” update could also be good for businesses as well. Though I am (mostly) against “newsjacking”, that’s when a person or a business reports or comments on a story that has already broken, for the sake of putting out content, it has proven to generate traffic (and sometimes leads) if it’s related to your business. What could this change mean for your business on Facebook, though? If you post about something that is getting a lot of engagement right now, you could give your Facebook Page a temporary “boost”. This could be good news for those that are looking to increase the reach of their Facebook Page. Okay, marketers, I know we all like shiny new things. We love to hear about the latest ways we can squeeze just a little bit more out of something than we could before. And there’s nothing wrong with that. Just remember that this is not meant to be used all the time. You may get more eyeballs on your content, but it might not be the right eyeballs. Your goal isn’t to always increase the Reach of your Facebook Page, but to always increase the engagement of those people who really care about your business. As a marketer you have the power to connect people with your brand in ways they wouldn’t have before. Use your power responsibly, and you’ll be more effective at your job. First of all, this blog post is about a trending topic. So it’s likely to get more views because it’s about a recent news story. It’s also about a Facebook newsfeed change, which tends to throw marketers and social media managers into a frenzy. However, it is also very much apart of my brand and my target audience. Since I’m trying to reach marketers and social media managers with my content, it’s likely to be seen by those people. Remember this rule when you’re using this tactic on your own Facebook Page. Your voice matters. I can’t say that enough. In fact, let me say it again. Your. Voice. Matters. When you separate out the words like that, it not only looks more important, it sounds different. There’s a reason for this. Each word means something all by itself. Let’s tackle them one by one to get a deeper meaning. This is an obvious word, but does bare a deeper look. First of all your voice will be different than anyone else’s. I think this should go without saying, but sometimes saying it helps us to understand that each of us has something unique to say. Let’s look at an example. We have two different business owners: Steve and Bob. Steve and Bob are the same age. They both grew up in the same small town. They went to the same school, and they had (for the most part) the same friends. They graduated in the same year and went to the same college in a neighboring city. Early on, they both realized that they loved to cook. So, when they got out of college they both started restaurants. But Steve and Bob are different people. Steve’s family life was not so great. He had a brother and a sister, and a mother and father who fought a lot. So, he learned to cook at an early age because that was his job and it was how he kept his family together. Bob is an only child. His parents were like a dream come true. In fact, they are his best friends. Bob learned to cook from his uncle who was a chef and used to visit in between trips around the world. Bob was fascinated by the dishes his uncle prepared, which were often exotic. Bob grew up trying to imitate the dishes his uncle would create during his visits. Steve’s necessity in cooking grew into a love of providing food to bring people closer together. Bob’s love of cooking grew into a passion for introducing exotic food to his small town. Can you start to see how each of these two men would not only open a different kind of restaurant but how they might have a completely different opinion on what to serve in those restaurants? Now imagine what each of these men’s blogs would be about. Do you think they would be different? Do you think they might even cover different subjects? Maybe Steve would write about his own budding family and how he is teaching his children to cook and prepare meals in a family setting. Maybe Bob would showcase a different meal he’s prepared each week. The point is that each person is different for many different reasons. And that’s a good thing, because that means that content written by each person would not be a carbon-copy of someone else’s. Can you imagine what it would be like if you landed on a blog about cooking and found that it was almost exactly like another blog that you read about cooking? How boring and annoying would that be? Find out what sets you apart or makes you different, and then put that into whatever you write. Voice itself is important because voice, sometimes even more than opinion, is what sets you apart from someone else. This can be influenced by opinion, but is more to do with your writing style and the words you use. I write in a more conversational tone. Someone else might write in a more formal one. Even if we wrote an article about the same subject, it would read in a completely different way because we used different words. You should choose a voice that feels comfortable to you when you write. If you like to tell jokes, then make sure you put jokes in your writing. It will make it much easier to produce content because it comes more naturally to you. Whatever you do, make sure your voice is consistent. That doesn’t mean that you can’t deviate occasionally. What it does mean is that your content will be recognizable to people across different platforms (i.e. Facebook, Twitter, your blog). It also means that someone who is used to reading what you write does not have to work as hard to understand what you’re saying. When you remove that obstacle, it makes reading much more enjoyable and they will be more likely to come back for more. Your voice does matter. What you say matters. The way you say it matters. And if you want to do something that matters, then using your unique voice to talk about it is the only way to connect with people. You don’t have to change the world to do something that matters. You just need to do something that matters to you. Once you know what that is, making sure that it shows up in your writing is key. In other words, write whatever you are passionate about. Writing about things that matter to you will also make the writing easier, because you already know and are excited about the subject. People also connect better with someone who writes passionately about a subject, because they can read that in your writing. How Can You Apply This to Your Social Media Plan? There is nothing better you can do for your social media plan than to find your unique voice and subject matter. It is one of the main things that will make you stand out from your competitors. Just posting is not enough you have to stand out. 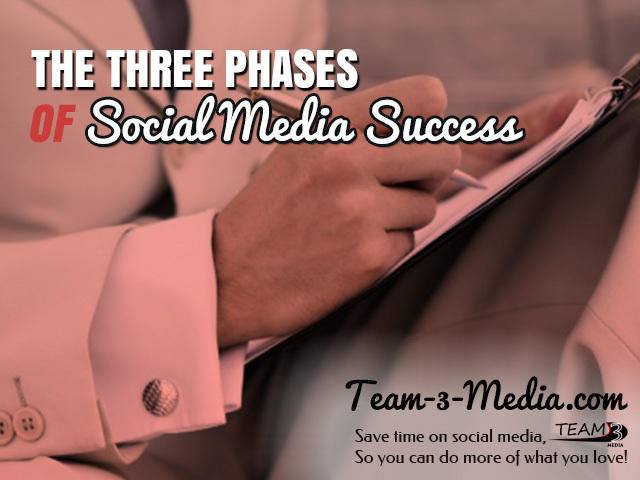 Use these three steps below to create content for your social media plan and you’ll see results. Figure out what makes you different. Write those facts down and use that angle to make what you say unique to you. Choose a voice that you’re comfortable with. You don’t need to win a Pulitzer with your voice. That would be awesome, though, right? You just need to find a voice that fits you and your audience. Even with their similarities, the two men in the example above had different things that mattered to them. It’s part of what would set their different content apart. Find out what matters to you and make sure you write about it. I’d like to know your results. If you will or have implemented these steps, let me know what your results are in the comments below.